Since 1928 Mickey Mouse has been entertaining kids all over the world. 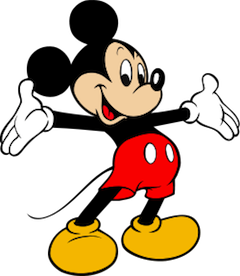 Created by Walt Disney and Ub Iwerks, Mickey is the most famous mouse of all time. He’s gone through some changes over the years, but his happy outlook on life remains the same. These are some of the lessons we can learn from this illustrious mouse. Look on the bright side of things – Mickey always has an upbeat attitude about life and its situations. People are quick to focus on the negative and how things are going wrong, but Mickey tends to focus on the positive. This is an essential lesson for making life a lot more productive. Smile – Mickey’s bright smile brings happiness to all his friends. Unlike Donald Duck, who seems to have a frown on his face as often as a smile, Mickey tends to live from a place of happiness that shows on his face. Be proactive – When Mickey is confronted with a problem or challenge, he comes up with a solution. In his clubhouse, he has tools that help him deal with the predicaments that arise. Being proactive is a valuable trait to instill in kids early on so that they will learn how to be solution oriented. Be helpful – All of Mickey’s friends can depend on him to help them through whatever crisis they find themselves in. Oftentimes, Mickey is the first to step up to the plate with a helping hand. Patience is a virtue – In many of the short films starring Mickey Mouse, his patience is tried by his friends. He gets annoyed, but he is pretty slow to get angry. In “Daisy’s Road Trip,” this point comes across clearly as he and Minnie put up with Daisy as their uninvited guest on a trip. Teaching kids how to be patient in an impatient world is crucial for goal setting and planning. Be polite – Rudeness seems to be running rampant these days. Many cartoons have put good manners on the back burner as well, but Mickey is still a gentleman. He is still always thoughtful and polite. It’s not too much to ask to say “please” and “Thank you” or show common courtesy. Kids can learn a lot about being polite from Mickey. Take proper care of your pets – Pluto is Mickey’s dog and his loyal companion. Mickey takes excellent care of his dog; this is a lesson for all children who want a dog or any other pet but shirk the responsibility of its care. Listen to your parents or accept the consequences – The sorcerer in Disney’s film, Fantasia’s “Sorcerer’s Apprentice,” isn’t Mickey’s father, but he is an authority figure. Mickey has chores to do, and instead of doing them he gets lazy and uses the sorcerer’s magic even though he was told not to do that. Eventually, he ends up in a situation he can’t handle. The sorcerer returns and cleans up the mess. For the most part, kids need to listen to authority figures in order to keep out of trouble. This segment of Fantasia illustrates what can happen when one doesn’t follow directions. Don’t allow others to get you to do things you don’t want to do – In the short film, “Daisy’s Road Trip,” Mickey and Minnie are frustrated that their romantic jaunt is ruined by Daisy Duck. If Mickey had just told Daisy that she couldn’t go with them instead of trying to let her down lightly, perhaps he and Minnie would have had a lovely trip together. Sometimes in life, you have to let people know they are being overbearing; you have to stand up for what you want. Keep your room clean – Ever notice how clean Mickey’s Clubhouse is? Nothing is out of place and everything always looks neat and clean. Little kids enjoy watching Mickey’s Clubhouse; parents can use this opportunity to point out to them how neat he is and how they should be neat too. Maybe this lesson learned from Mickey will entice your kids to pick up after themselves more often. For an 84 year old mouse, Mickey is doing quite well for himself. Parents can take advantage of the lessons to be learned from his TV show, Mickey’s Clubhouse, and from his many movies and short films. Showing your kids how to apply lessons from these shows to their lives can help you instill essential values in your children in an enjoyable manner.